These multi-faceted musical conversations add up to an exciting artistic departure for Chris and Máire. From the purest well-spring of the Irish tradition come the 17th century solo harp Gol na mBan san Ár, the newly-discovered 18th century Hidden Pearl arranged for harp & string quartet and an elaborate set of jigs. Two of the four songs are here recorded for the first time in these versions, one of them in the free-form, uniquely Irish sean-nós style. Scotland is represented by the Beeswing Hornpipe and Donald MacLeans Farewell to Oban / Duntroon Castle. From this traditional core, they explore new musical styles & approaches to arrangement. Three Piece Suite, composed by Máire in a traditional style, gets a slightly African-influenced treatment. Other full band arrangements include the irresistably jaunty bluegrass Twinkle Little Star and Chriss compositions, the Caribbean-influenced Banana Yellow & the jazzy Swinging the Lead. With each outing they make, this pair continue to amaze and stun with their sparkling virtuosity and incredible tightness. Guest musicians include Máires sister Nollaig Casey on fiddle and Simon Mayor, who contributes a characteristically virtuosic solo in the swinging finale, on mandolin. 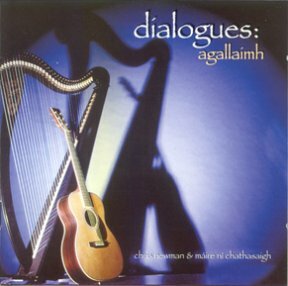 The album title perfectly sums up the way Máíres harp and Chris guitar interact with each other. Perhaps the most stunning example of this is the foot-tapping, bluegrass style Twinkle Little Star, which is guaranteed to bring some sunshine into your life. As well as all these wonderful instrumental tracks, Máire also contributes several songs and her harp solo, Gol na mBan san Ár - an example of Irelands older harp music - has a spare, stark beauty about it, reminiscent of her performance of Carolans Farewell to Music. She plays with passion and admirable restraintjust listen to the bass notes of her Camac harp resonating boldly without interruption. Chris and Máire are off on another journey of musical discovery with this latest CD. Thirteen tracks of music and song with long-time collaborator (well, she is family) Nollaig Casey, fiddles, viola, backing vocals; Liz Hanks on cello, Roy Dodds, percussion; Ian MacFarlane, fiddle on track eight and the educated mandolin of Simon Mayor on track thirteen. but they do, in fact a reviewer with more musical knowledge than I, might say that they will be gathered into the arms of the tradition without a second thought. Two of the folk scenes most respected musicians have put together a CD of what can only be described as beautiful music, if that is not too cheesy a phrase! A mixture of songs and tunes, all are played with wonderful control and really effective dynamics. No duff tracks here; its really a matter of picking out personal favourites, so pardon the subjectivity  here are a few highlights for me: the playing on Colonel Robertson, clean, light and devastatingly accurate; Banana Yellow with a tune that does bring the sun out (well, it did when I was listening to it); Twinkle Little Star bringing back memories of Chris playing at the Ironbridge Bluegrass Festival a few years ago, and holding an audience spellbound with a series of staggering solos; Swinging the Lead with perfect swing guitar playing; the atmosphere created by the harp and whistle especially in Gol na mBan san Ár, and so on, for virtually the whole CD. What really holds much of this CD together is the understated rhythm playing; tight, never overpowering but providing a perfect background to the tunes and songs at the front. As you may have gathered, this is quality stuff. The range of material is excellent, with a really broad appeal.